When you're sick, you stay home from work. When you're due to deliver a baby, you definitely stay home from work. But not so if you're British Member of Parliament Tulip Siddiq, and one of the most pivotal votes in the history of your country is about to take place. 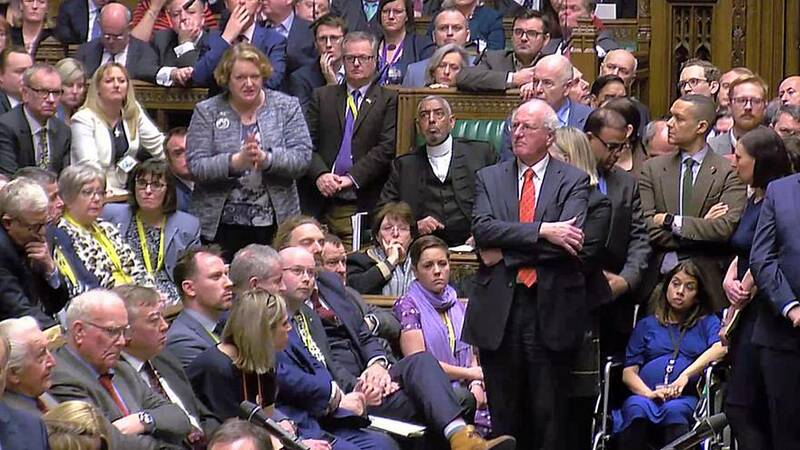 Instead of delivering her baby in a scheduled ceasarian-section, Siddiq delayed the birth and was pushed into the House of Commons in a wheelchair in order to cast her vote (she voted no, contributing to the Prime Minister's historic defeat). In British Parliament, if an MP wants their vote counted, they must show up— meaning that during parental leave, their voice in the Commons can go silent. For years, some MPs and rights campaigners have been trying to change that by instituting proxy voting, so an MP who is present can cast the vote on behalf of the one who's absent in a situation like parental leave. "I think the sight of Tulip Siddiq coming through the lobbies in a wheelchair was really the final straw for a lot of Parliamentarians and a lot of campaigners on this," said Sam Smethers, head for Fawcett Society and a backer of the bill. "We've been calling for this for some time, it's been several years in the making, and we're really pleased that Parliament is finally now getting the chance to vote on something which frankly, should have been in place a long time ago, and other Parliaments deal with it all over the world already." Currently in place is a "pairing system" whereby parties coordinate votes to accommodate those who are away— if, for example, a Labour MP is ill or on leave, a Conservative will be tipped to refrain from the vote as well, meaning the final tally comes out with the same balance as it would if the MP were present. But the system doesn't always work as planned. "The pairing system is a system run by the whips, essentially," said Smethers. "And that has worked in the past. But it broke down with Jo Swinson when she was on maternity leave and Brandon Lewis, who was the Conservative Party chairman famously voted although she wasn't there to vote herself. So I think MPs have lost faith in that system." The vote that contributed to wavering faith in the pairing system was held last July, and MP Jo Swinson accused the Conservative government of flagrantly breaching the agreement in order to ensure a narrow vote was passed. If today's vote approve, the proxy system will begin a yearlong trial pending reviews. "It's a year of trialling it out. There are a number of MPs who are about to go on maternity leave, about to have their babies, so we'll see quite soon whether it's working. Obviously it's a difficult sense of political timing in the UK with the Brexit vote so it will really be tested, in that sense. But it's important that this really does work and that we give it a good chance to operate, and that we come back at the end of that year and put something in place permanently."